This fun math game comes from The Kentucky Center for Mathematics! I found this fantastic site (chock-full of games) from Mrs. T's First Grade. Check out her site for more game recommendations! 1. 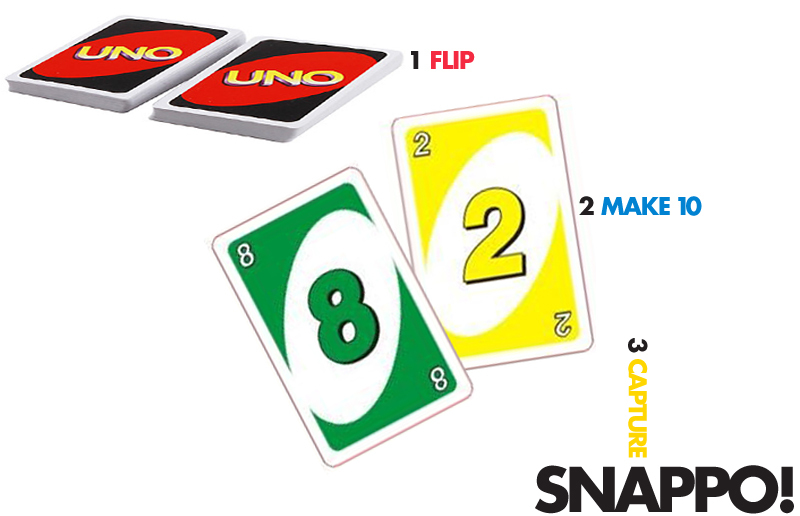 Divide uno cards (numbers only: 0-10) evenly among players. 2. Players lay their cards face down in a pile. 3. Player one flips top card over and lays it on the table. 4. Player two flips his card over. If he can make 10, he captures both cards and says "snappo!" If he can't, he lays his card face up on the table. 5. Players keep taking turns, flipping cards, trying to make 10. They can use the cards on the table or cards opponent flips over. Their goal is to make 10, say snappo, and capture the most cards! Game ends when there are no matches left. The player who captured the most cards wins!